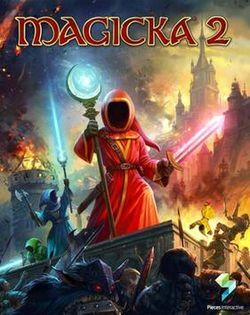 Magicka 2 is an action-adventure video game, the sequel to Magicka, for Microsoft Windows, Mac OS X, Linux and PlayStation 4. It was released on May 26, 2015 and was announced at Sony's E3 2014 media briefing with a trailer.Instead of being developed by Arrowhead Game Studios, the title was developed by Pieces Interactive alongside the publisher Paradox Interactive. Promotional hood given to demo players at PAX 2014. This page was last edited on 11 June 2017, at 03:35.